Nolan, an Italian helmet manufacturing company is better known for its extraordinary helmet shapes and designs. 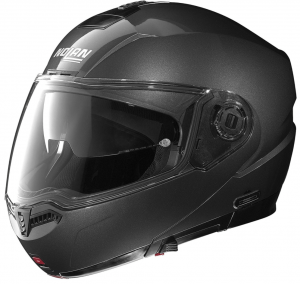 The trend seems to continue with Nolan N104, which is a modular, full-face motorcycle helmet with a boatload of promising features. 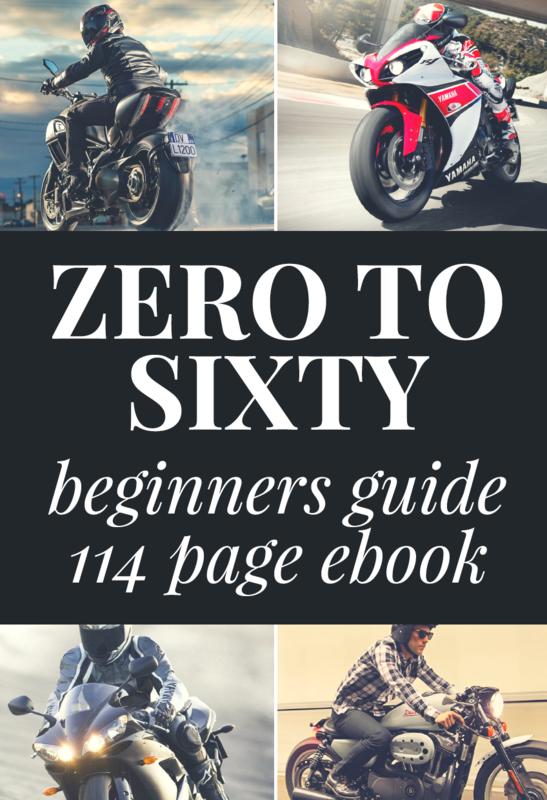 The shape and the design of the helmet are the first two things that will attract the customers. Stylish curves, bright contrasting colors and glossy finishing look simply marvelous. It won’t be wrong to say that Nolan has reinvented the modular helmet with Nolan N104. 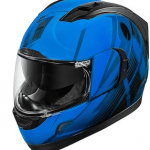 Certified by the DOT and ECE-2205, this helmet is roaring in the global market because there are not too many helmets that stand par with N104 in terms of shape, design and features. Whether it is the shell of the helmet or the face shield, everything seems to be flawless in Nolan N104. Let us take a look at the vital parts of this amazing modular helmet. Nolan N104 Shell: Is It Safe? The shell of this helmet has been constructed with a poly-carbonate material. There have been many tests conducted on the shell, most notably the SHARP 4 Star Safety tests in which, the helmet got 4 stars out of 5. The shell comes in two sizes, which is good in terms of fit, design, and safety. 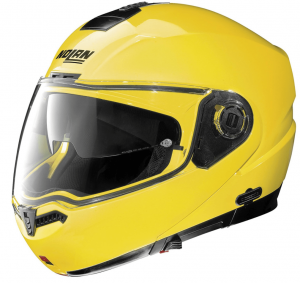 There is no doubt upon the fact that the Nolan N104 is one of the safest helmets available in the market today. Ventilation: How Efficient Is It? The ventilation system works fine in the places where it remains hot for most of the year. Also, the places where it remains cold, riders are going to get a mist-free vision. Bike riders are going to get two separate forehead vents, both of which are operated with a single slider. The ventilation system of this helmet is better known as the AIR-BOOSTER ventilation, which also comes with a Microlock2 retention system. There is a chin vent included in the helmet underneath which, a chin curtain is attached. The combination of both chin bar and curtain keeps the chin sturdier. When the slider is clicked, the top vent opens, allowing air to come in and reaching it over the head. After that, the air travels to rear vents and finally gets out. Clicking the slider a bit more will open the other forehead vent, which is placed right above the visor. What this vent does is, it directs air over the visor causing more air to come in the head region. The slider bar is equipped with the VPS system that results in instant retraction. The operation of the slider is quite smooth and it can be used with gloves as well. The exhausts don’t seem awkward, as the company has integrated them well with the design of the helmet. 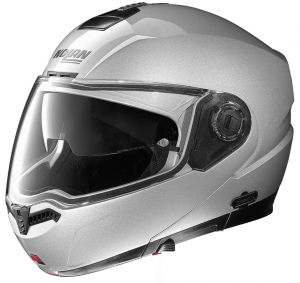 The face shield given in N104 offers a comfortable riding experience to the riders. 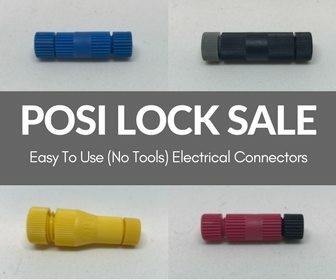 It works on the simple push button mechanism. To ensure safety and 100% clear vision during odd weathers, the face shield comes with a Pin-lock Anti-Fog System that doesn’t allow fog to accumulate on the face shield no matter how much foggy the weather is. The face shield of N104 has got a lift-tab, which can be clipped onto the detent of the center of the chin bar.By lifting the shield slightly in the upward direction prevents the fog to set up on the shield. This is done when the rider needs fresh air. Otherwise, that Pin-lock Anti-Fog System is good enough to keep the fog away. 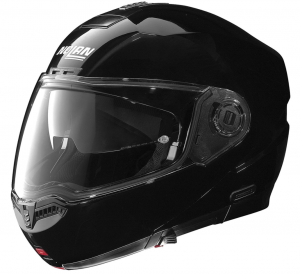 In order to ensure an uninterrupted vision and safety of the riders during the rainy season, the company has given an eye port gasket that is tightly attached to the face shield, hence sealing out the rain from entering into the helmet. Water usually hits at the top of the gasket, then goes to the sides of the face shield where it drains pretty quickly due to the rotating mechanism of the face shield. In order to remove the shield, a bike rider has to raise the face shield, then push the spring loaded tab in the upward direction to release the shield. It will pop off immediately. The company has also included two visors; main visor and drop-down Sun visor. Where the main visor is used to provide an excellent peripheral vision, the role of the sun visor is to bar the annoying sunrays that literally blind the bike riders. The sun visor moves in up and down position, and in order to remove the visor, just press the button that is given on the lower left corner of the helmet. To retract the visor, slide the slider. The presence of both the visors has really made it easier for bike riders to ride the motorcycles in a convenient manner. Padding: How Soft And Comfortable Is The Nolan N104? Well, the padding is quite thick and gets easily adjusted according to the shape of the rider’s head. The padding is proficient in absorbing the moisture and doesn’t seem to stink as well. The company has treated the padding with the natural silver salt, which is perhaps the reason for its antifungal and antibacterial nature. With the integration of a neck roll, the company has further enhanced the comfort of the bike riders, but this neck roll can cause the body temperature to rise during the summer season. Not to worry, as this neck roll is removable, but the noise level will be increased by doing so. The EPS system is perfectly molded and the size of the ear pockets is quite large to accommodate speakers within the helmet. Nolan has made its N-Com system, which is used by the bike riders to communicate with each other. This system includes a built-in microphone and a speaker. There is a special pocket given in the EPS, which is in the rear of the helmet to accommodate the unit. The padding can be removed and washed with the normal detergent. It is also washing machine washable, so there is nothing to worry. Where most helmets are given a thick coating, Nolan N104 seems to have a special coating, which gives a hard feel, as if there is a covering of a glass sheet done on the helmet. After the painting of the helmet, a special water-based coating is done on the helmet. 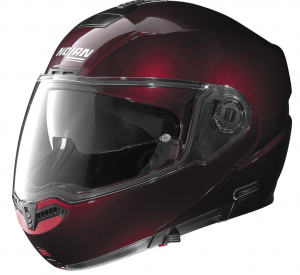 The helmet is currently available in six colors, silver, black, gray, white, wine cherry and cab yellow. When it comes to the graphics, the company seems to have found the perfection, as it has got ‘voyage’ graphic that comes in anthracite, yellow and blue/white colors. Conclusion. Tech + Style Makes the Nolan N104 A Must Have Helmet. 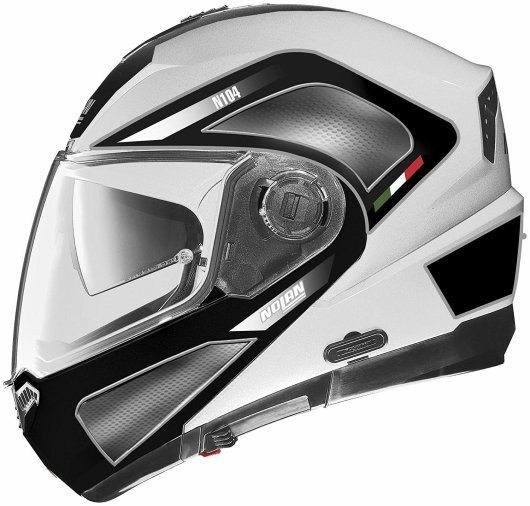 With the perfect amalgamation of the modern technology and the mesmerizing style, Nolan N104 it is no surprise that it has become one of the most sought after helmets in the world. This modular helmet has a plenty of features that are extremely useful in day-to-day riding. N104 can be worn in any weather condition because it comes with fog and rain protection, sun shield and multiple vents that work really well together. The weight of the helmet is quite light which also makes it the perfect companion for long bike rides. Overall, a great helmet that’s worth every penny.